For all those times when you’re in the mood to eat Pizza Hut, but just feel like you should be eating more precious metals with your cheese and sauce, the chain is putting an expensive twist on its new Stuffed Garlic Knots Pizza, by sprinkling a “nearly $100 worth” of edible gold on top. Pizza Hut’s publicity stunt pizza (stuntza?) is timed to this Sunday’s Super Bowl 50, which will be played in Santa Clara, CA between the Carolina Panthers and the Denver Broncos. 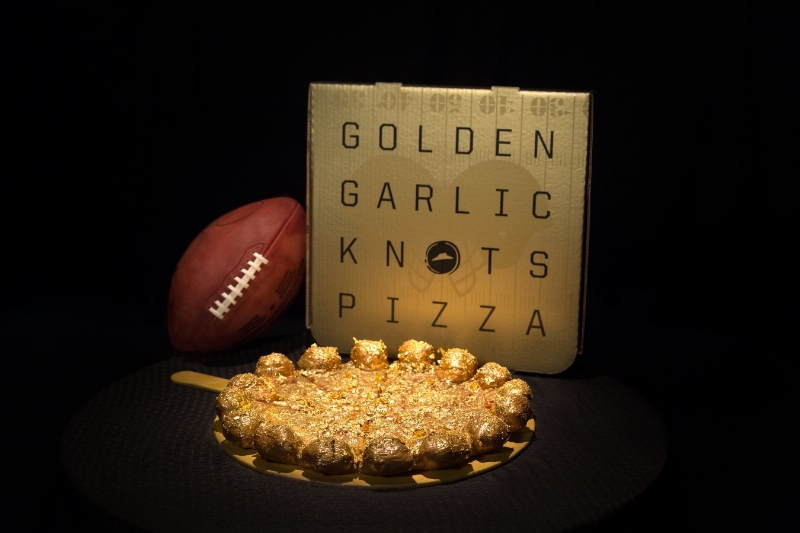 “It’s not every day that the Golden Anniversary of the Big Game is played in the Golden State, so we felt it was only appropriate to celebrate with a limited-edition Golden Garlic Knots Pizza,” said Jared Drinkwater, Vice President of Marketing, Pizza Hut in a press release. There won’t be an unlimited supply of these special-edition Golden Garlic Knots Pizzas, Pizza Hut says, and you won’t be able to request one directly: 50 people who order a Stuffed Garlic Knots on Feb. 7 in select markets will have a chance to receive one of the 50 special golden pizzas. They’ll arrive in a custom gold-colored- box along with a $100 Pizza Hut Gold Card.